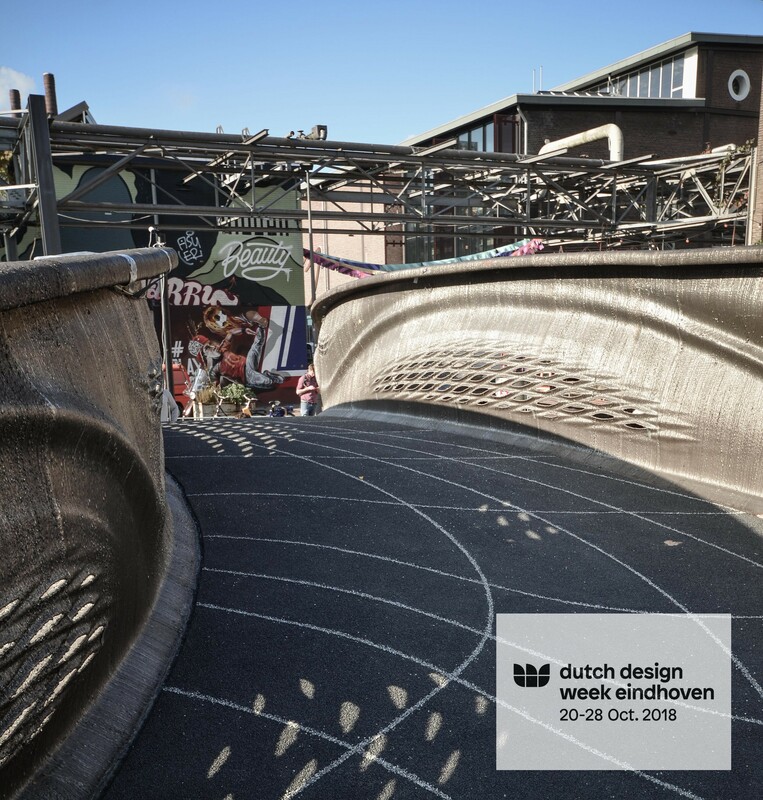 The MX3D Bridge, designed by Joris Laarman Lab, with Arup as lead engineering partner is now ready to be installed at its final location, but will first be on display at the Dutch Design Week (DDW) in Eindhoven, from October 20th till 28th 2018! In addition to its unique construction, the bridge is also a living laboratory for data scientists. It is instrumented by Autodesk, Force Technology, Imperial College London, Lenovo & HBM with an innovative sensor network. 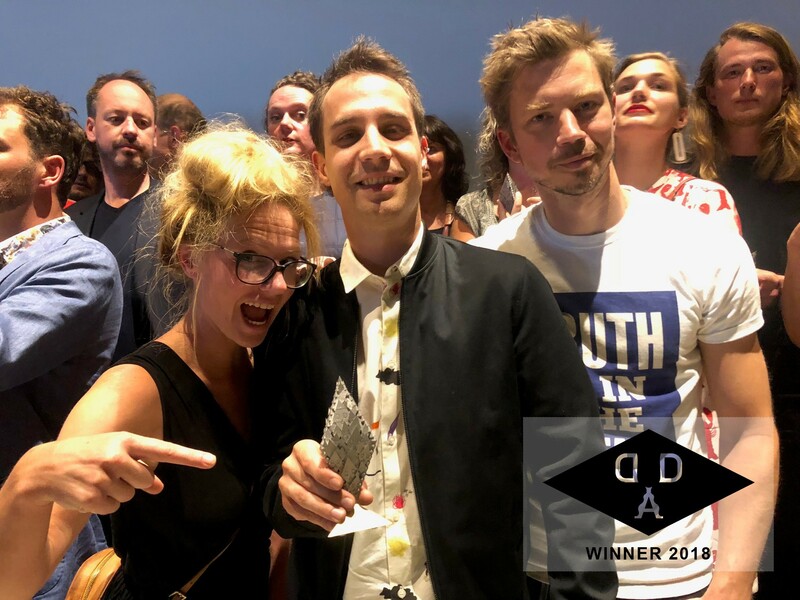 Very proud that we are one of the winners of the Dutch Design Award 2018 in the category Design Research! 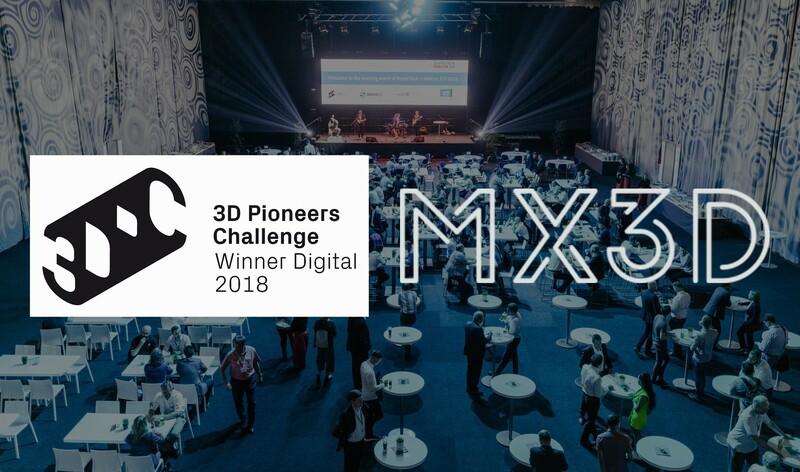 We are happy to announce that MX3D has won the 3D Pioneers Challenge for the digital category! 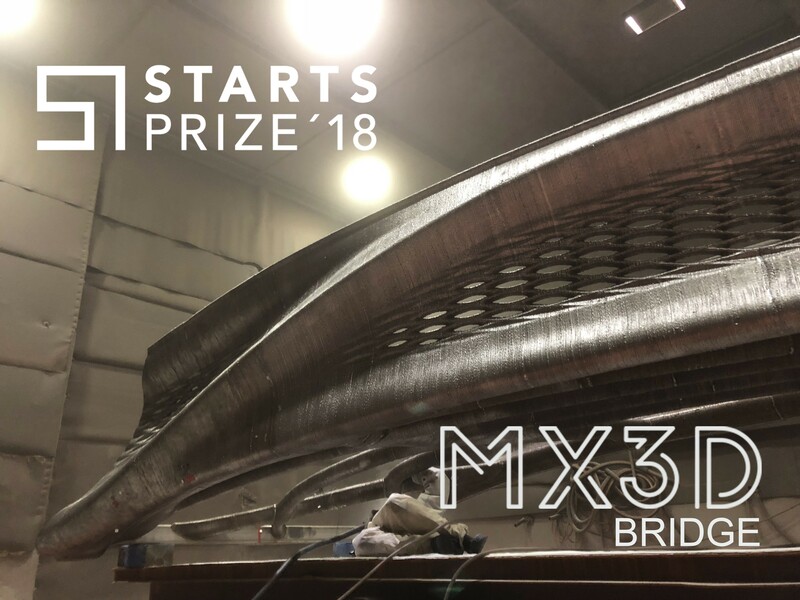 MX3D Bridge has been awarded the STARTS Prize 2018! 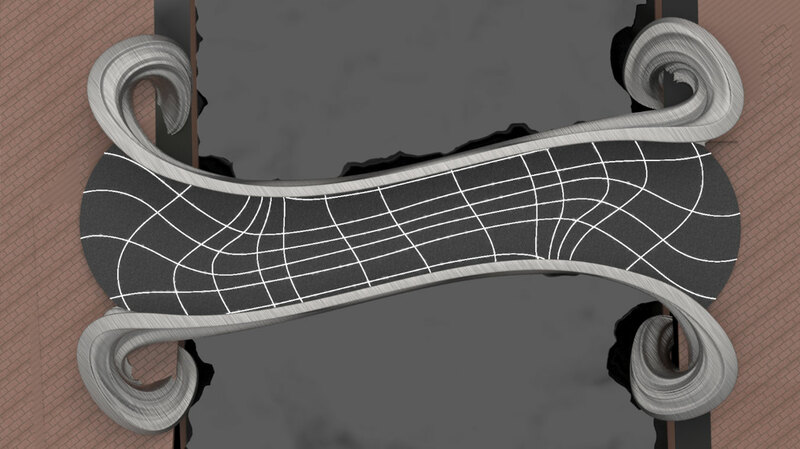 The full span of the bridge is finalized! With close to a third of the bridge printed at the time of writing, we are well on track to be finished printing early 2018. By now, we’ve also mounted a robot directly on the bridge. What a great moment! The first tests with the robot printing in-situ are promising. We’ve managed to print a nice part horizontally; but there are still many issues to resolve. Soon, we will attempt to move the robot on the bridge and allow it to continue to print. After a challenging 18 month-long process of engineering, designing, re-engineering, re-designing, discovering the world behind permits, safety measures, canal wall renovation, re-designing, programming, fundraising, test printing, re-designing and re-programming, the actual printing of the bridge has finally started. 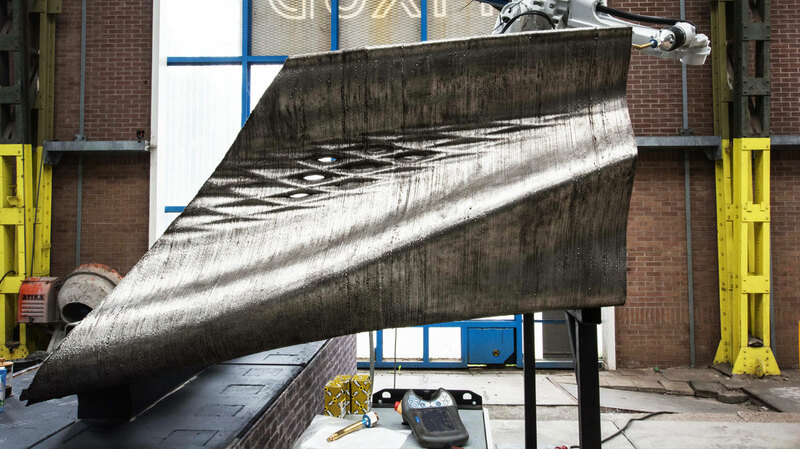 We are printing large parts of roughly one metre, which will then be assembled together after they’ve been printed. The initial production pace seems fast enough to finish by early 2018 – exciting times! The final design is finished! We already explained in earlier posts that the design needed to change significantly due to regulatory, engineering and practical reasons. 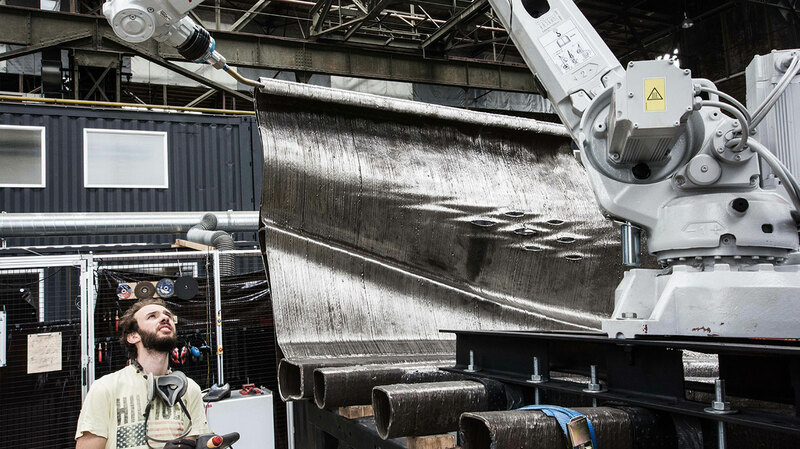 Joris Laarman Lab and Arup came up with a design that shows the potential of this technique, with a powerful new aesthetic. After a serious setback, we are back on track at last. In order to reduce complexity we employed an entirely new approach. 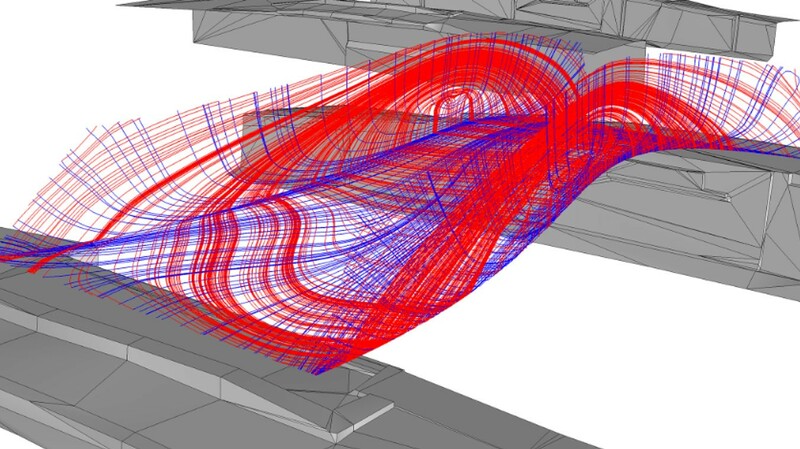 In November of 2016, Arup joined our rockstar team and we began discussing a sheet-construction approach rather than the previously-attempted one centred around volume optimization. 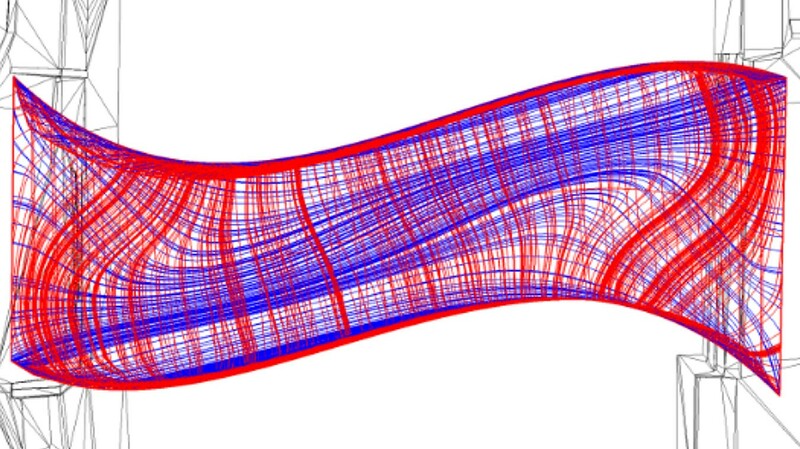 The benefits of the sheet concept were that it works primarily with compression forces using stress analysis software to generate force lines through the object. A highly detailed 3D scan demonstrated that the bridge heads are not entirely parallel. 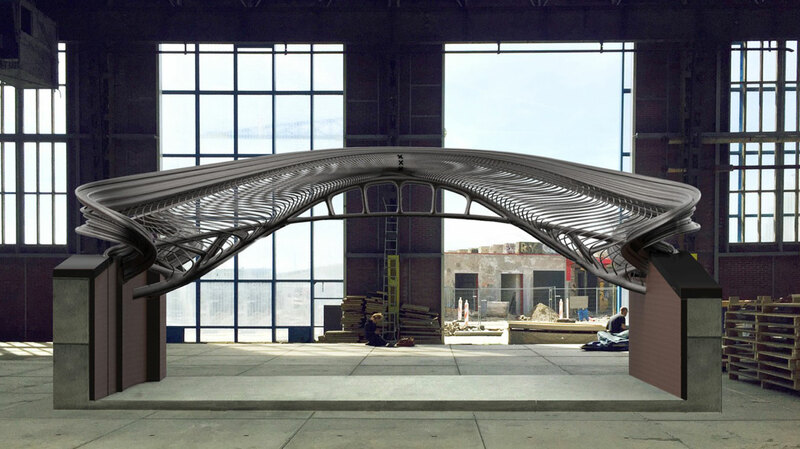 As a result of this newfound information, we chose to give the bridge an asymmetrical shape, in-plan. This increases the dynamic shape and allows to show that our proprietary technology is not bound by traditional, symmetrical forms. 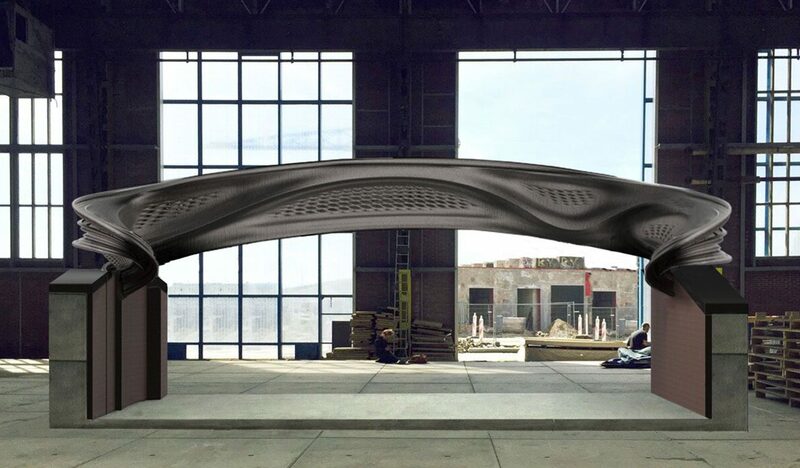 By making the entire bridge design parametric, the design adapts automatically with every design iteration; believe it or not, we can even make changes to the design after the robots start printing! Today, the modern world of optimisation software and 3D printing clashed with the traditional world of typical construction engineering. The engineering software used to address the various functional and safety requirements could not handle our complex geometry. Additionally, there remained many unknowns yet to be taken into account; amongst other factors, it was unclear how much stress the medieval canal walls could withstand and it also turned out to be near-impossible to define the material properties of the printed geometries. This means we have to start all over again… Basically, we need to reduce complexity and avoid tension stresses as much as possible. Let’s hope we can make this happen quickly! We have finalised the design at last! 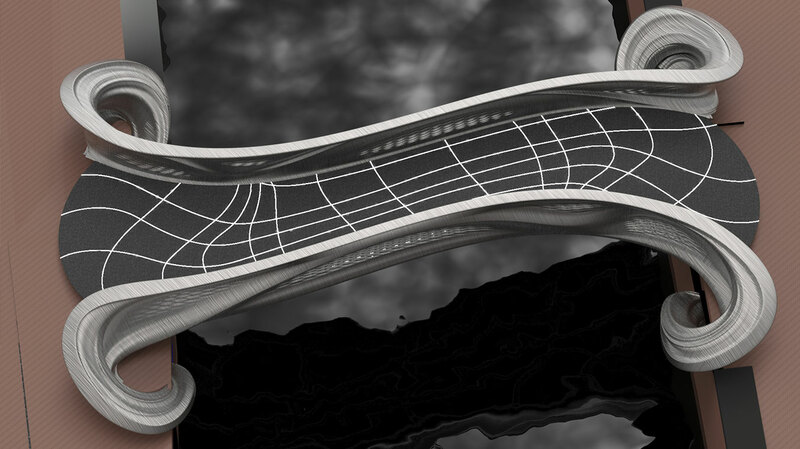 The initial design concept was focused on a very pure application of topological optimization; this particular technique was employed extensively early on in Joris Laarman Lab’s pioneering Bone Furniture collection. The software is programmed to reduce the required material to a minimum when generating the most efficient shape for a specific task – just as a bone will optimize itself in nature. 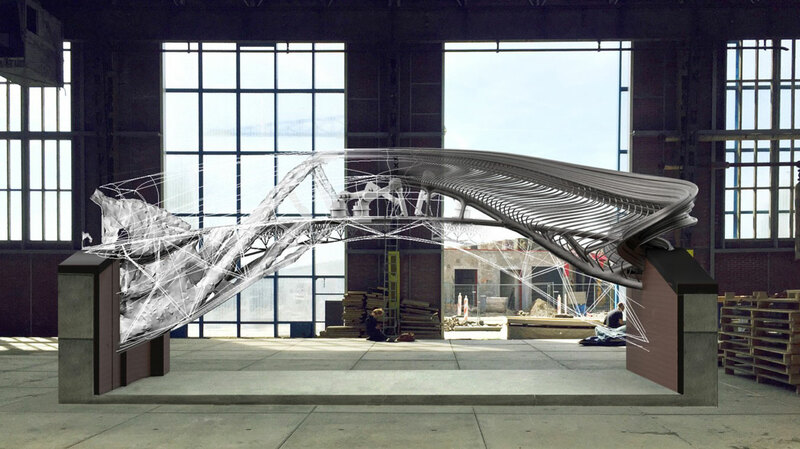 The Bridge design employed Autodesk’s Dreamcatcher software in collaboration with the engineering expertise of Heijmans. The final location has been set, and it is nothing short of iconic; it is to sit upon the crossing of the Oudezijds Achterburgwal and the Stoofsteeg. In other project-related news, we are proud to add Plymovent and Oerlikon to the team!d ArcelorMittal, ABB Robotics, Lenovo and Air Liquide to our team. And thank you Leap3D for making this scan! October ‘15 marks the official launch of the Bridge project: our project video had so much worldwide exposure that it managed to attract all the additional connections we needed to make it happen. Now, it’s up to us to show we can make this dream a reality. A big thank you goes out to the City of Amsterdam for becoming an actual customer of this unique bridge. And thank you to Elderwoman Kasja Ollongren and CEO of Heijmans, Bert van der Els, for opening our new workshop. It has been great to add ArcelorMittal, ABB Robotics, Lenovo and Air Liquide to our team! It would look like it defies gravity; layer by layer we deposite metal that solidifies until the bridge is ready. The bridge project would, to a large extent, be a learning process; we don’t know how long it will take, but we are certain we can develop the software and hardware to make this project happen. In any case, it will be a great adventure and we are bound to discover new techniques. 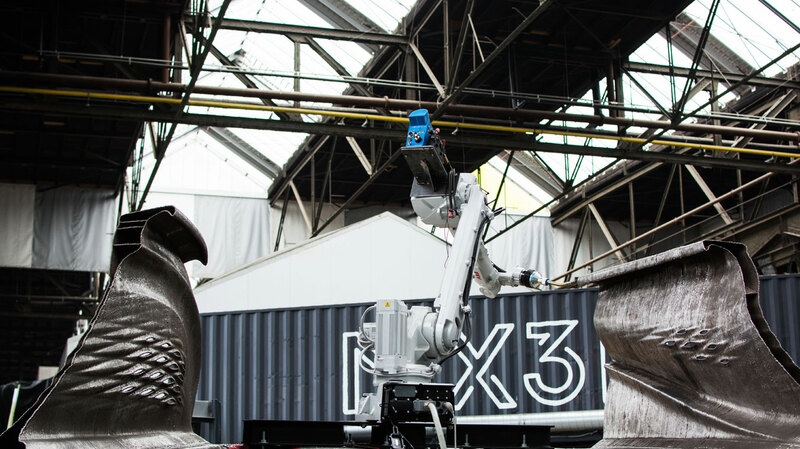 Autodesk, too, was thrilled to come aboard, and the project was born.